In keeping with the motto "Free streets – Open spaces. Insights. Visions." the main road “Lange Straße” was transformed again into a colorful, car-free area on the 15th of September. The road and the parking space were closed to cars all day. Instead, the participating clubs, associations, culture and sport enthusiasts used it as a space for exhibiting their various ideas and for offering hands-on interactive activities to the public. The event attracted several hundred people and was again very positively received. The organizers wanted to raise awareness of the issues of "sustainable mobility" and "climate change". Cargo Bikes, Pedelecs and fun bikes were on display all afternoon and the road was busy with long boarders, skaters, and pedestrians. Children painted the road, took part in an interactive circus, played on the Deutsche Bahn (DB) toy train, and could get a fanciful face make-up. Adults could browse the many creatively designed information booths or enjoy a goulash soup. For a day, the drearily gray parking spaces were transformed into colourful oases. Highlights included a solar cooker in action, wool spinners at work, and tasty sunday coffee at the coffee bike. A colourful stage program was offered to visitors through the entire afternoon. Projects for sustainable mobility and present-day activists were offered a forum to present their projects and ideas on a main stage. Musical entertainment was provided by a Rostock school band. One of the traditional highlights was the presentation of all city cyclists who had participated from August to September 2013 in the Climate Alliance campaign "city cycling". The team that had jointly biked the longest distance received an award. Also, the ADFC handed out an award to the owner of the most beautiful oldie bicycle. The Rostock Agenda 21 Working Group "Climate protection and mobility" consists of representatives of Deutsche Bahn AG, the Rostock Tramway AG (RSAG), the General German Bicycle Club (ADFC) Rostock eV, as well as of the Rostock city council. Since 2009, the Working Group annually organized a public climate action day as an integral part of the European Mobility Week in September. In 2012, the first car-free climate action day took place. 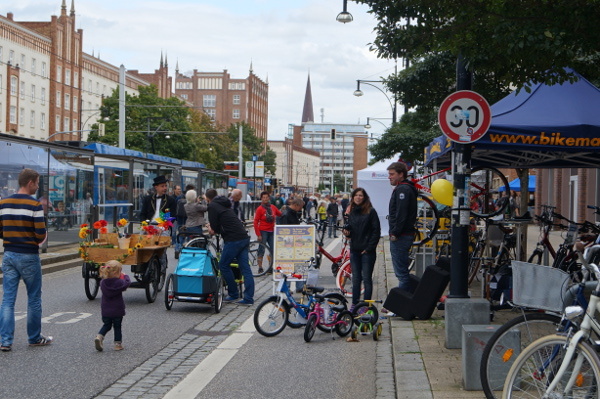 2012 the Hanseatic City of Rostock organised together with the Agenda21 group "mobility and climate protection" the first car free Climate Action Day. Important partner were ADFC Rostock, the RSAG (Rostocker Straßenbahn AG) and the DB (Deutsche Bahn). The event took place in the "Lange Straße", a busy street in the city center with many shops, tramway lines and (usually) car traffic. During this day, the 16th of September 2012, the street was closed for car traffic and people could walk, cycle or skate on a stretch of about 600 metres. 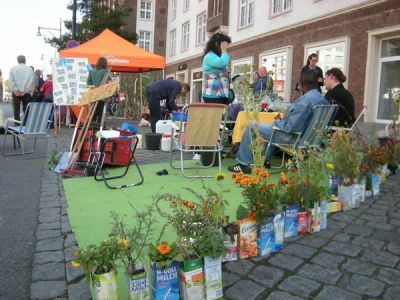 The municipality invited everybody to redesign a parking spot and called it the first PARK(ing) Day in Rostock. Many initiatives and inhabitants created small parks, galleries, resting places or presented climate friendly transport facilities. During the car free day in Rostock the company WERK3 made a photo shooting in an empty shop in the "Lange Straße". They invited people to be photographed with their bicycle. A professional photograph took pictures of about 50 people. The photos are published on the website www.radregion-rostock.de for a voting. The municipality edited a postcard (citycard) to promote the photo shooting. A special highligt of the car free day was the presentation of the first cycling monitor in Rostock. The municipality invited all participants and the media to this event at 3:00 pm. The cycling monitor was covered by a big "surprise egg". An artist on stilts uncovered the cycling monitor, accompagnied by musicians and many cameras. 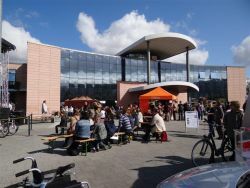 In 2011 a "Climate Action Day" under the motto "Mobile for the climate in Rostock” took place nearby the Rostock Central Station on 16th of September in the framework of the Europeaen Mobility Week. The Hanseatic City of Rostock organised the event in cooperation with the city's action alliance “Mobility and climate protection”. The event highlighted sustainable mobility, climate change and alternative energy. The Climate Action Day referred to the most ecological means of transport - the bicycle. Everybody had the opportunity to encode the own bike. Young visitors had the chance to test an energy-power-bicycle for boiling water only by using pure muscle power. The adult visitors were delighted by testing a Pedelec (electric bike). A special highlight was to make a good deal at the large auction of bicycles. The results of a feasibility study focusing on a “Bicycle Station at the Rostock Central Station” were presented and dicussed in a panel discussion with politicians and stakeholders. The urban public transport operator (Rostocker Straßenbahn AG - RSAG) presented its new hybrid bus and explained the environmentally-friendly hybrid drive. A big stage, professional presenters and live music from a school band called “Lieschen Müller” accompanied the interesting stage programme. Roundabout 200 people visited the event. 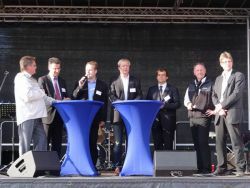 On the climate day the Hanseatic City of Rostock awarded also the best teams and companies in 2 different competitions. 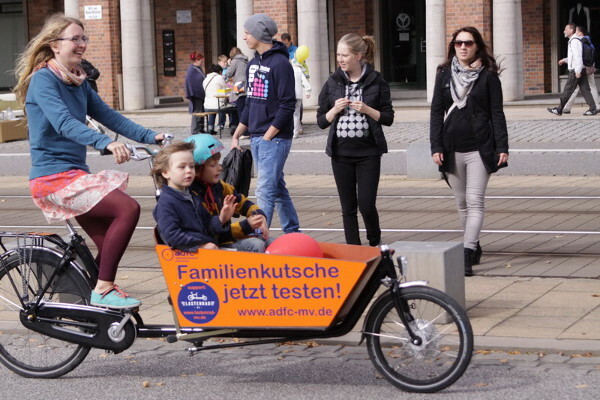 For the second time, the Hanseatic City of Rostock took part in the Climate Alliance action „City Cycling" (German: "Stadtradeln“). Compared with the year before, Rostock tripled the number of participants as well as the distance cycled. The participants cycled in teams for three weeks (August 15th, 2011 – September 4th, 2011). Together they collected kilometres cycled and put the results of it in an online-calendar. Moreover, they shared experiences and lots of fun as well as applied a method of a healthy life-style and improved their relationships. In 2011, more than 370 members in 27 teams cycled a distance of more than 47.000 kilometres (more than the length of the equator) and saved 7 tons of carbon dioxide!!! We awarded the best ones in the “City Cycling” in seven categories. The best female and male cyclists were pleased with a prize money of 100 € and a high-quality bicycle computer. The best teams were awarded with 250 € - such as the most active school, the most active class, the very best cycling team, the most active cycling team and the most fancy team. The Hansesatic City of Rostock see a great importance for improving the conditions for cycling employees. Employers will benefit from healthy, fit and dynamic workers. They can offer facilities that make it easier to cycle to work, e.g. convenient bicycle stands, showers and special wardrobes. 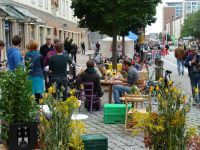 That's why the Hanseatic City of Rostock announced a second grant for the „Rostock’s most bicycle-friendly enterprise 2011”. 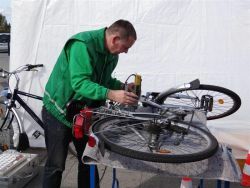 In early summer 2011 the Hanseatic City of Rostock and the German Bicycle Association ADFC asked enterprises and institutions in the city to participate in the competition. They received four applications, two of them were determined as winners. 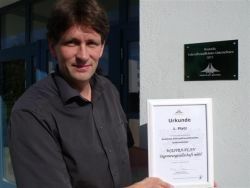 “Rostock’s most bicycle-friendly enterprise 2011” is the engineering company WASTRA-PLAN in Rostock. The employees of WASTRA-PLAN were pleased about a cash prize of 300 € and a green insignia to be placed at the front side of their office building. The jury was impressed by the service available for the employees (repair shop, showers, covered bicycle parking). The second prize went to the University of Rostock. The employees won a cash prize of 200 € for their exemplary cooperation with schools and other partners with respect to their own cycling policy.